Very few places are quite like Kasauli. A holiday in this hill town of Himachal Pradesh remains a part of their wish lists while travelling to the Himalayan state. Nestled at an elevation of 3647 m in the wooded forests of pine and oak trees as well as the lofty hills of the Himalayas, Kasauli, is loaded with attractions that have the potential of offering a visitor this cantonment town a mind-blowing experience. Once the summer resort of the British, Kasauli holds great appeal for those in search of tranquil surroundings and is ideal for leisurely walks amidst the spectacular natural charms. Apart from the Mall Road, a regular feature in most of the Hill Stations in India, colonial era relics like Baptist Church and Christ Church and many points make your visit to this hill station in the Solan district. Kasauli also come lauded as the birthplace of famous writer, Ruskin Bond. Billed as one of the Kasauli’s top attractions, Christ Church is known for its Gothic style of architecture. Located on the lower Mall road, the church must be visited to have a piece of mind amidst peaceful ambience. Watching the sunrise from Sunrise Point is one of the best things to do in Kasauli. Formerly known as Hawa Ghar, this famous tourist attraction is located on the Lower mall and offers panoramic view of the city of Chandigarh and its surroundings. Established in 1905 as the Pasteur Institute of India, Central Research Institute has contributed immensely to the growth of biological sciences. This top research institute imparts educational and research courses to the students. Kaushali has one of the most amazing trails to offer along with the beauty of the lush green hills. One such trail is Gilbert trail. The mysteries of the landscape gradually unfold as you traverse this one and half km track through verdant landscape. 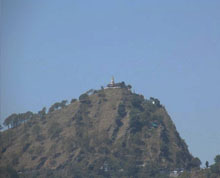 4 km from the Bus Stand, Monkey point is highest tip in Kasauli. The place derives it name from the sage Man-Ki who was a devotee of Lord Hanuman. A shrine of Lord Hanuman is located on the point from which you can stunning view of Chandigarh. You will require special permission to visit the Monkey point as it is a restricted area. Located six km from the centre of the town, Nahari Temple is a scared place attracting visitors. Located near the shrine is a fresh water spring. Located in proximity to the sunset point, Lover's Lane is so named as the path offers serene and peaceful environs amidst the trees to the couples. 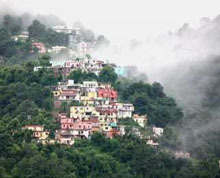 The upper and lower malls running through Kasauli's length are the main promenades of the town. They are ideal for long leisurely walks and shopping souvenirs. Here you will find the relics of the British Raj reinforcing the colonial ambience. Situated half km away from Garkhal, this temple is located in a picturesque landscape. Built in 1989, the shrine dedicated to Sai Baba Shirdi is visited by people who come to Kasauli. The path leading to the temple offers you stunning views of the surroundings. Also known as Mohan Meakin's Solan brewery, Kasauli Brewery and distillery is the oldest is the oldest brewery in Asia founded by in 1820s Edward Dyer, a relative of Major General Dyer, the butcher of Jallianwala Bagh, Major General Dyer. 17 km from Kasauli and 4 Km from Dharampu, the sleepy village of Dagshai finds a place of prominence among the off-the-beaten-track destinations in Himachal Pradesh. The place is home to a residential Army school and a church. Surrounded by pine trees, the place is home to military cantonment, a residential Army school, churches (St. Patrick Church, St. Angelin Church) cemetery and Central Jail where freedom fighters were incarcerated. Dagshai has also some excellent viewpoints. How to reach Kasauli by Air: The nearest airport is Chandigarh which is 65 km away from Kasauli. 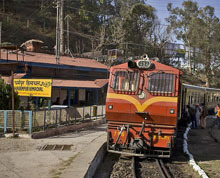 How to reach Kasauli by Rail: Dharampur, 12 km from Kasauli, is the nearest railhead. Kalka, located at a distance of 37 km is a more convenient railhead. How to reach Kasauli by Road : Kasauli is well connected by road to different places in India. Some of the cities and places connected with Kasauli by road are Chandigarh (65 Km), Panchkula (49 km), Kalka (37 Km), Chail (74 km), Shimla (77 km), Jalandhar (196) and Delhi (286 km). Regular bus services connect Kasauli to Dharampur, Chandigarh, Ambala, Kalka, Shimla and Patiala. Taxis are also available from Kalka and Chandigarh. Accommodation in Kasauli is not an issue for any travelers visiting this beautiful hill town. There is plenty of accommodation available ranging from luxurious hotels to budget hotels. Kasauli is filled up with lots of resorts and hotels catering to the needs of everyone. Visitors are advised to book in advance during the peak season. Hotel Ross Common, Alasia Hotel, Kasauli Castle Resort, Kasauli Resort and Kasauli Regency are some of the famous hotels in Kasauli.